Institute of Directors in New Zealand (IoD) chief executive Kirsten Patterson says the world is in a period of exponential change. The technological disruption brought by the current ‘Fourth Revolution’ will require New Zealand’s directors to engage in innovative thinking, agility and sound risk management. Datamine Founder and IoD member Paul O'Connor echoes Kirsten's sentiments - here is his take on the risks (and opportunities) technological disruption is posing for Directors in New Zealand. As Directors, part of our risk oversight duty is to work with management to develop and ultimately approve the business strategy and prepare for the future as best we can, because the unknowns often pose either a major risk or a major opportunity for the organisation. Therein lies the conundrum – in order to keep pace, we’ve got to stay up to date and constantly be on the lookout for new technologies to capitalise on. Meanwhile, we must also look at the risks these emerging technologies bring with them and making sure we have our data governance and management, digital leadership, cyber security and privacy compliance sorted. This may be sales, production, distribution, partnerships or any other business area. 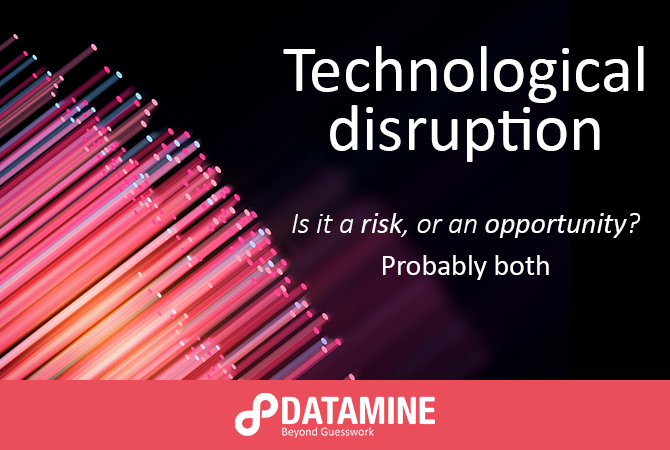 What area of the business is showing the most risk (or promise) of being disrupted technologically? For each of these areas, take note of what’s available, what competitors are doing and what adjacent industries are creating and adapting to fit the evolving market. Research and compare your business to others - what have similar organisations struggled with, or excelled in? And how can you apply those learnings to your situation? This should be with other Directors, managers or anyone else that has knowledge in the specific areas where things could potentially be disrupted. Bringing together your collective intelligence and broad range of skills and expertise, discuss the potential risks and opportunities that could arise from the areas identified in your market analysis. Develop a straw man or a walking skeleton outlining these factors, and work together with leaders from across the business to refine them. List out the activities and technologies you need to prioritise, both in terms of risks and opportunities - this could be technologies the business should adopt or competitors may introduce, or it could be preventative measures you should take in order to combat an emerging technology that could threaten your business. Given the list of priorities, start to set the direction for what you want to do - does your list err more on the side of risk-averse? Or are new technologies presenting more opportunities than they are risks? Use this information to identify the different factors that will impact, either positively or negatively, the achievement of your organisational objectives. You’ll need to nurture (or bring on) a team of people who have the expertise necessary to lead your business through, and capitalise on, this era of unparalleled technologic disruption. As you can imagine, this is a time-consuming and potentially uncomfortable process, but it needs to happen in order to ensure your business stays up to speed with the pace of technology. And if you have the right support around you, it works – we’ve been using this framework for our AI and Machine Learning initiatives since the 90s, when we came across the very new (and very untested) technology and saw both an opportunity and a risk. As you might guess, the opportunity outweighed the risk, and we became one of the first NZ companies to hit the AI and Machine Learning scene with some neural network patents designed to streamline business operations. Today, we use our knowledge and expertise in this space to help our clients turn new techs into competitive advantages through their data analytics, their AI and automation projects, blockchain initiatives and more. Technological disruption is a very real phenomenon in today’s business sphere – and it’s one we’re all ultimately going to have to embrace. But with careful consideration, and by simultaneously capitalising on opportunities and mitigating risks, we can guide our organisations through the changing technology market. Paul founded Datamine in 1995 and has overseen the company's growth into its current position as a key player in the data analytics community. He brings a human touch to data analysis, translating 'geek-speak' into English and never failing to turn the imponderable into actionable insights.